Jewish Attributes :: "Helping Hands"
The Aramaic term “B’siyata d’Shmaya” abbreviated as “Beis Samech Daled” literally means “with Gd’s help”. This simple phrase reminds us that our Creator assists us in everything we do. Many Jews write this phrase at the top of their written pages as a prayer for success on the words written below. In the four corners of this art piece are hands, reminiscent of “Chamsas”, each holding a precious gemstone. 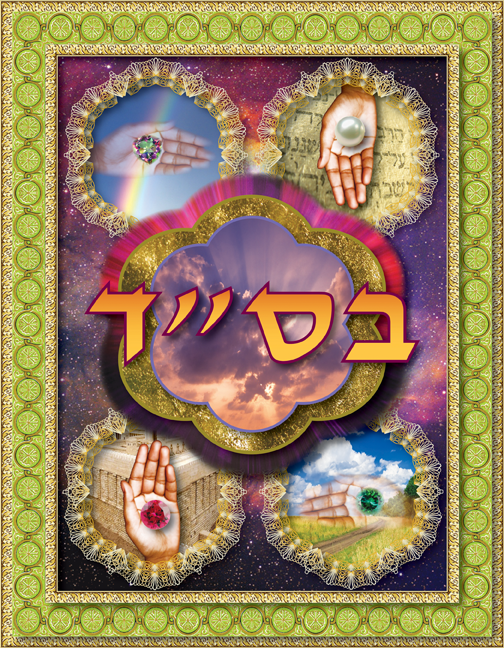 Within the upper left window is an ethereal hand with an amazonite stone refracting the rays of a multi-hued rainbow. This symbolizes the gift of the divine covenant that G-d made with our people after the great flood of Noah. The upper right window depicts a hand with a gleaming pearl, representing “pearls of wisdom”. Sacred words of Hebrew are depicted in the background, reminding us of the gift of Torah that was given to us at Mt. Sinai. It is our blessed task to use this wisdom to enrich our lives and become more spiritual beings. In the bottom right window is a landscape of fertile ground and glorious sky. A clear path appears showing us the journey ahead. An ethereal hand, the hand of G-d, offers us the gift of the earth’s bounty for sustenance and prosperity as symbolized by the bright green gemstone. In the bottom left window is a hand holding a ruby red gemstone. In the background is the Holy Temple, divinely inspired, yet built by the hands of man. This sacred toil represents the everlasting partnership between G-d and the Jewish people. 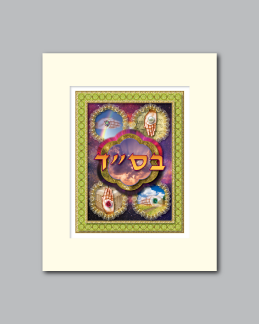 The center, or “heart” of this art piece are the Hebrew letters “beis samech daled” which seem to float over a portal leading us heavenward. Beams of light carry us upwards to higher spiritual planes. These letters, in their simplicity, remind us that everything we do is with the help of Hashem.